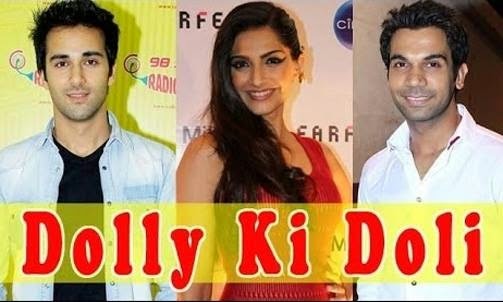 Dolly Ki Doli - Sonam Kapoor First Look, Cast and Crew, Plot Outline, Dolly Ki Doli is a bollywood movie starring Sonam Kapoor, Rajkummar Rao & Pulkit Samrat. Film is Directed by Abhishek Dogra and Produced by Arbaaz Khan. Dolly Ki Doli is a bollywood movie starring Sonam Kapoor, Rajkummar Rao & Pulkit Samrat. Film is Directed by Abhishek Dogra and Produced by Arbaaz Khan. Dolly Ki Doli' is a woman centric quirky drama where Sonam plays a bindaas North Indian girl Dolly and will be accompanied by three other male co-stars. she plays a runaway bride. But unlike the Hollywood film by the same name in which lead actress Julia Roberts had commitment issues, this one is about a girl who gets married and runs away with the groom's money. More Updates Coming Soon.. Stay Tuned!